Real Madrid eased to a third straight Club World Cup title as Luka Modric and Sergio Ramos scored in a 4-1 final victory over home team Al Ain in Abu Dhabi on 22 December 2018. 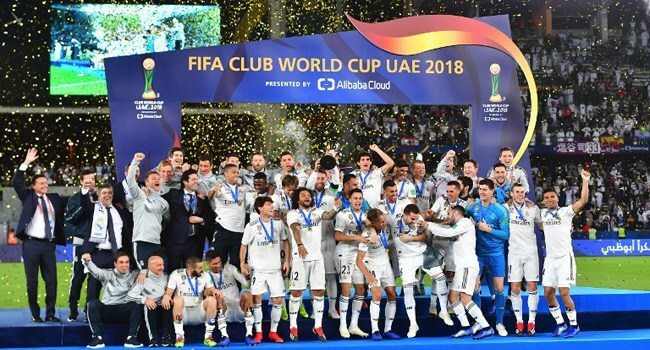 The Spanish giants have now won a record four Club World Cup titles, pulling one clear of arch rivals Barcelona, who were in La Liga action. Lionel Messi wins record 5th Golden Shoe Award: Lionel Messi on 18 December 2018 collected a record fifth Golden Shoe award for finishing last season as the top goalscorer in Europe. The striker scored 34 goals in 68 games for Barcelona, putting himself ahead of Liverpool’s Mohamed Salah and Tottenham’s Harry Kane. Cristiano Ronaldo, who has won the award four times, hit 26 goals in 52 matches for Real Madrid. Luka Modric ends Lionel Messi, Cristiano Ronaldo Ballon d’Or Duopoly: Luka Modric saw off competition from a host of French World Cup stars as the Real Madrid and Croatia midfielder won the 2018 Ballon d’Or on 4 December 2018, ending the 10-year stranglehold on the award by Cristiano Ronaldo and Lionel Messi. Modric, 33, was announced as the winner of the prestigious prize in a glitzy ceremony held in Paris. Modric — the oldest winner since Italy’s Fabio Cannavaro, also 33, in 2006 — was crowned after an outstanding year in which he starred in the Real side that retained the Champions League before heroically helping drag his country to the final of the World Cup for the first time in their history. Croatia lost 4-2 to France in Moscow in the final in July. The prize comes after Modric claimed the Golden Ball for the best player at the World Cup before picking up UEFA’s prize for player of the season and FIFA’s best player award in September.